An overview of the conference participants. 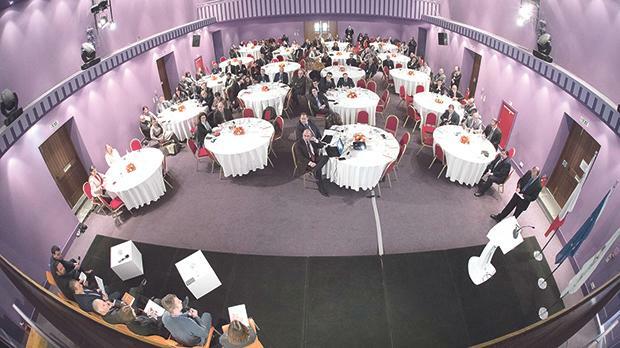 Entrepreneurship and employability was the theme of this year’s annual conference of the Malta College of Arts, Science and Technology (Mcast), which was held recently at its main campus in Paola. The conference focused on understanding the link between entrepreneurship and employability, the importance of entrepreneurship in Vocational and Educational Training (VET), industry skill sets when employing people, teaching entrepreneurship, shaping the curriculum to meet industry needs in order to inform, train and form students, the role of mentors in entrepreneurship education and ways on how to assess entrepreneurship. Entrepreneurship is one of the three pillars of education at Mcast, the others being a multidisciplinary curriculum and work-based learning. It was first introduced through a module at degree level, and gradually further modules were introduced across all levels. The programme was based on similar programmes abroad, however students were not being engaged properly, as at first entrepreneurship was looked upon as a glorified business studies subject. This led to a complete reconstruction of the entrepreneurship programme and entrepreneurship education concept. Taking a two-fold approach, Mcast has since developed a programme to equip participants with the knowledge, skills and competencies to succeed in an entrepreneurial eco­nomy. The curriculum aims to provide students with the tools and confidence re­quired to embark on the path of business creation or utilise such skills in their place of work. The programme also engages in entrepreneurship-related acti­vities that serves to enrich the learners’ experience. Apart from providing incubation spaces for business development, mentors are assigned to students and alumni who approach Mcast’s Entepreneurship Centre with a business idea, to guide them towards reaching their full potential through thought-provoking discussions. The new programme is based on a three-tier approach whereby the student is first informed about entrepreneurship, followed by training and formation to becoming entrepreneurial, until finally the student learns how to become an entrepreneur. The conference was addressed, among others, by Education Minister Evarist Bartolo, Eric Flask, director, Innovation and Entrepreneurship at Mcast, Louis Aquilina, director, Partnerships Office, Silvio De Bono, president of the Mcast’s Board of Governors, Mcast principal and CEO Stephen Cachia, Mcast vice- principal Vincent Maione and Nadia Marie Vassallo, director, Curriculum at Mcast. During the conference, Prof. Godfrey Baldacchino from University of Malta moderated a panel discussion that included Dr Leonie Baldacchino from the university, Matthew Bezzina and Ivan Refalo from industry, Dr Mario Cardona from Mcast, student Danika Formosa, Mcast alumni Roberto Tweraser.